~Where can I find just the right solos that are correlated to the weekly Bible Lesson? ~Where can my church purchase sheet music? 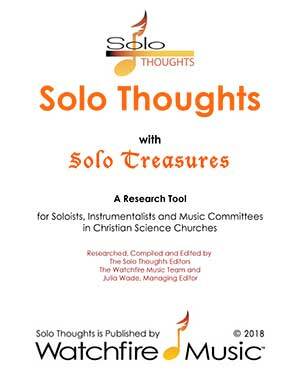 Watchfire Music has the perfect solution: We offer our highly researched monthly and quarterly publication, Solo Thoughts. So what exactly IS Solo Thoughts? Created by Watchfire Music’s team of editors, it’s a downloadable resource tool in PDF format that is essentially a comprehensive list of ideas for solos -- matched to the weekly Bible Lessons -- for your church service. With just one click of the mouse, Solo Thoughts will appear on your computer as a pdf file. It's true power lies in using the resource on line to click through directly to the purchase page of each solo that is referenced. You may, however, also print the resource as well. Get Updates to each Quarter's Issue! Check out the Solo Thoughts Errata page for information updates and corrections organized by quarter. I love Solo Thoughts. It has been so helpful in finding solos for church. Did I thank you for providing the Solo Thoughts resource? If not, thank you. Thank you for researching these grand solos in Solo Thoughts!